Most of Progressive Structures’s jobs entail digging around underground utilities, which are very expensive to fix if damaged, so it’s imperative that it has versatile tools that allow it to easily maneuver around these utilities without slowing down production or decreasing the quality of the work. In 2011, Augustyn was introduced to Rototilt (formerly known as Indexator) at ConExpo in Las Vegas, Nev. Compatible with any excavator from 1.6 to 33 ton (1.5 to 30 t) capacity, Rototilt attachments have 360-degree continuous rotation and 40-degree tilt each way. Since then, Progressive Structures has purchased three Rototilt attachments. The latest two are equipped with Rototilt’s pin grabber to pick up standard OEM buckets and a high flow swivel to operate plate compactors or other high flow tools under the Rototilt. When it comes to customer service, Progressive Structures couldn’t be happier. “They [Rototilt] personally flew to Iowa to install our new attachments, and have been out to visit our job sites multiple times. They have made us — and continue to make us — feel like we are their number one priority,” said Augustyn. In October 2012 Progressive Structures took on a project in Emmetsburg, Iowa, to make drainage improvements to the farmland. A large purpose of this job was to catch all the rainfall in a wetland to help filter nitrates and other harmful chemicals to keep them from going into the rivers. One-hundred sixty thousand cu. yds. (122,329 cu m) of dirt had to be moved to build a wetland and new drainage ditch, which included a 20,000+ LF of 12 to 54 in. (30.5 to 137 cm) concrete pipe. More than a mi. of this pipe was 16 to 23 ft. (4.8 to 7 m) deep 54 in. concrete pipe. “We had 10 semis hauling this pipe non stop during this phase because they could only haul five pipes each load. We did our underground operation a little differently than we normally have in the past. We had one Cat 349 perform the subcut to get 10 feet of the top material off and a second 349 to pull a trench box to dig down to grade. We had a ramp in from the back of the trench box to lay the pipe with our custom-built pipe hook we used with our Rototilt. With each pull of the box we would lay a pipe, compact it with our modified compactor and push a road forward with a dozer. 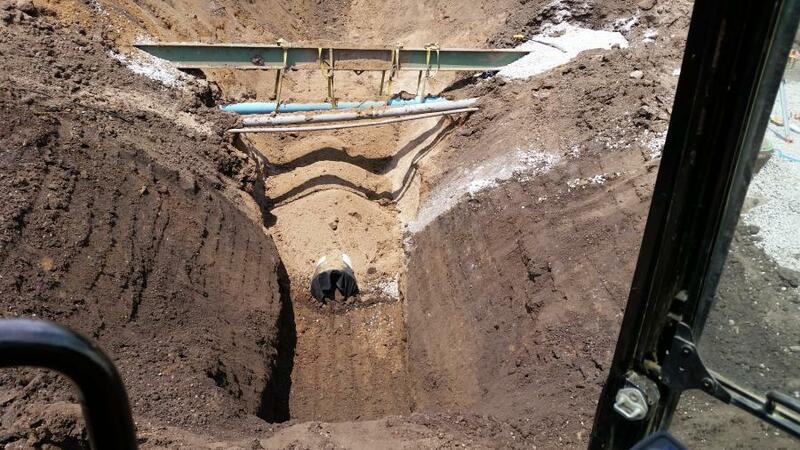 With this method our best day we laid 400 feet of 54 inch concrete pipe,” Augustyn said. 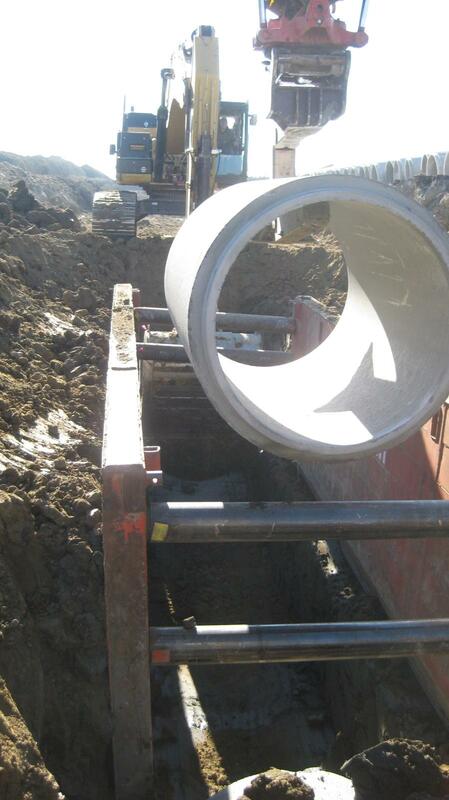 In September 2013, Progressive Structures began a nearly three-year project to install storm sewer in Des Moines, Iowa. The new grade and pave job is 2.7 mi. (4.3 km) long, with more than 18,000 ft. (5,486 m) of storm sewer and more than 150 cast-in-place intakes and manholes. Approximately 500,000 cu. yd. (382,277 cu m) of dirt had to be hauled and more than 60,000 sq. yd. (50,167 sq m) of pavement. 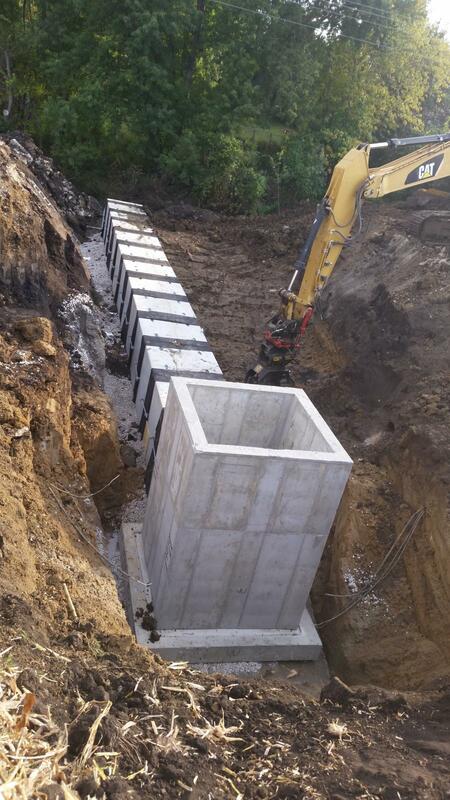 Progressive Structures also used its Rototilt to replace box culverts in Humboldt, Iowa. Despite a 20-day schedule, the company finished the job in only five days. With the new culvert installed, the slopes were safer and the water was discharging to the waterway at a better angle, resulting in less erosion during heavy rainfalls, according to Augustyn. Quality and safety are paramount to the Progressive Structures’ team. They are not afraid of a challenge, regardless of how big or small. Augustyn foresees more high-risk jobs becoming available within the near future due to Iowa’s increased gasoline tax. He is looking forward to the challenge and is preparing by hiring new, experienced employees, promoting within the company, and keeping their employees up to date on all of the necessary certifications and training. For more information, visit http://www.progressivestructuresia.com/Home.html or http://rototiltnorthamerica.com/.